Don't know much about crab fishing in Alaska? We gathered a few facts to give you some background on one of the deadliest jobs in the country. 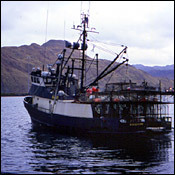 The most lucrative Alaskan crab fisheries occur in the fall and winter; the seasons are often short, lasting less than four weeks. In the Bering Sea specifically, the two most active months are October and January. Each season, approximately 250 crab fishing boats converge on Dutch Harbor, Alaska, in search of Alaskan king crab. Crab vessels cost several million dollars to build, and tens of thousands of dollars to operate annually. The boats range in size from 40 to 200 feet; each crew typically consists of one captain and three to nine deckhands. Because the sonar used on most fishing boats is downward-pointing, it doesn't detect crabs that are right against or buried in the ocean floor. Furthermore, since it is impossible to predict where adult male crabs will be (unless it's spring, which is mating season), captains must rely on intuition to find the best crabbing location. To catch the crabs, fishermen use 700-pound steel traps ("pots") baited with ground herring, squid, sardines and cod, which are dropped 400 feet below the ocean's surface. On average, the pots measure 7 feet by 7 feet by 3 feet, and soak anywhere from five to 24 hours before being hauled back on deck.